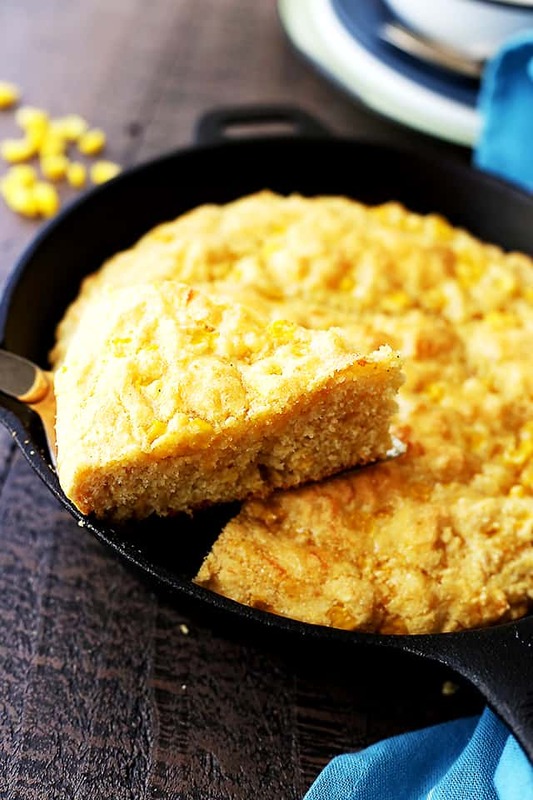 Light Skillet Cornbread – Loaded with fresh corn and a handful of cheddar cheese, this flavorful, lightened-up cornbread is the perfect side for your soup or chili! Hey y’all! ⬅I LOVE saying that! How’s life? All is well? GOOD! Can I tell you that I’ve never been more tempted to reach through the screen as much as right now? That golden and fluffy thing up there is just so enticing. Do you want to kick me for acting so ridiculous over cornbread? SORRY! I just like southern food more than any other. Darn butter and shortening make me run from it, but I always try to find a way around it all. I probably don’t even need to tell you, but this bread is kind of my jam right now because Beer Beef Stew and Slow Cooker Chili are finally on our dinner menu rotation, again. I don’t care if it’s 78 degrees outside and that I could probably get away with a Jack Daniel’s Grilled Steak. It’s still mid October, and that means cozy sweaters, comfort food, and tall boots. 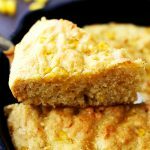 If you are a cornbread (corn bread?) purist, you are going to want to throw me to the curb, I know, buuuut! This is the road we must take if we want to lighten up on those calories and fats. ALSO? 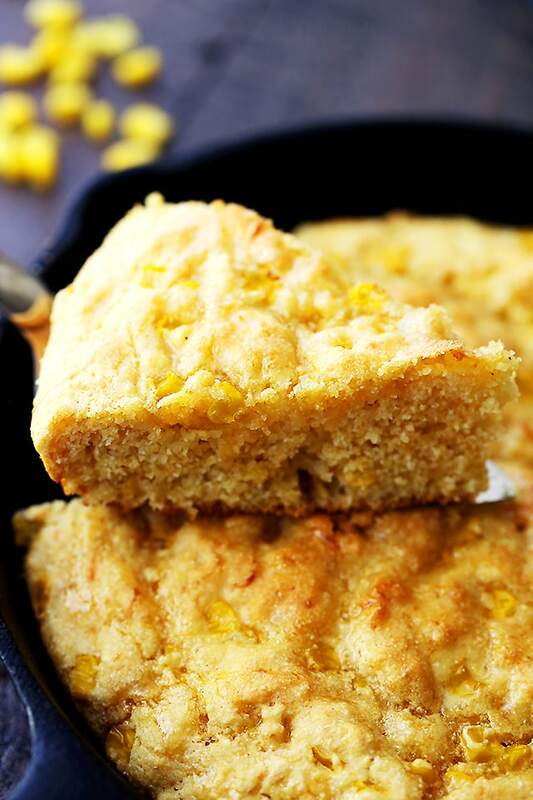 This cornbread is very good! I promise you! Best part is that you will need one mixing bowl + a cast iron skillet. That’s all. 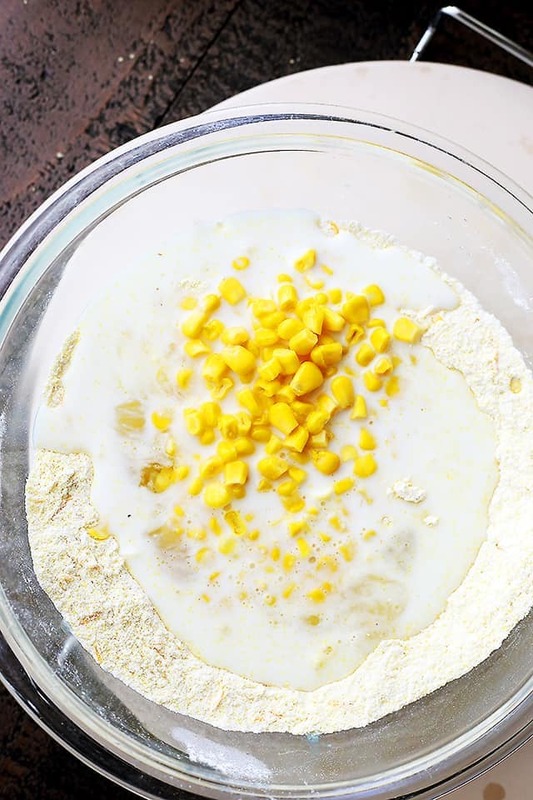 Step One: 1 to 1 ratio is the standard for corn bread – 1 part flour 1 part corn meal. That is what I’ve always heard and read. If I am wrong, talk to the America’s Test Kitchen people. Step Deux: Add cheese. Always. Step Three: Milk + egg whites. No yolks. No butter. NO SUGAR. See where we’re going here? 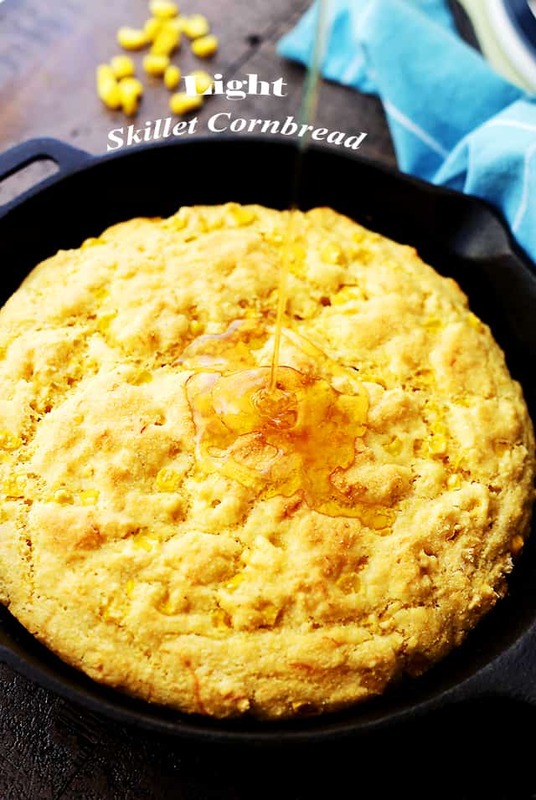 LIGHT Skillet Cornbread. Step Cetiri: FRESH sweet corn kernels… YUM! You won’t appreciate this part until you get to bite into it. Best crunchy bite of ever. Step Six: Do not forget the HONEY, hunny! Did you notice? I can count in 4 languages. And I can count alllll the way up to TEN! P.S. If ya wanna add some more fixins – garlic, onions, jalapeno slices, etc… – g’ahead! Lightly grease a 9-inch cast iron skillet and sprinkle the bottom of the skillet with a teaspoon of corn meal; set aside. In a large mixing bowl, whisk together the flour, corn meal, baking powder and shredded cheese. Add milk, eggs and corn; using a wooden spoon, stir until completely incorporated. Transfer mixture to previously prepared skillet and smooth out the top. Bake for 25 to 30 minutes, or until a toothpick inserted in the center comes out clean. Cut and serve with a drizzle of honey. Whole wheat flour, alone, will make the bread real tough and not really edible. I suggest using 60% all-purpose and 40% whole wheat. Oh yummy….what a perfect side dish for so many fall soups! 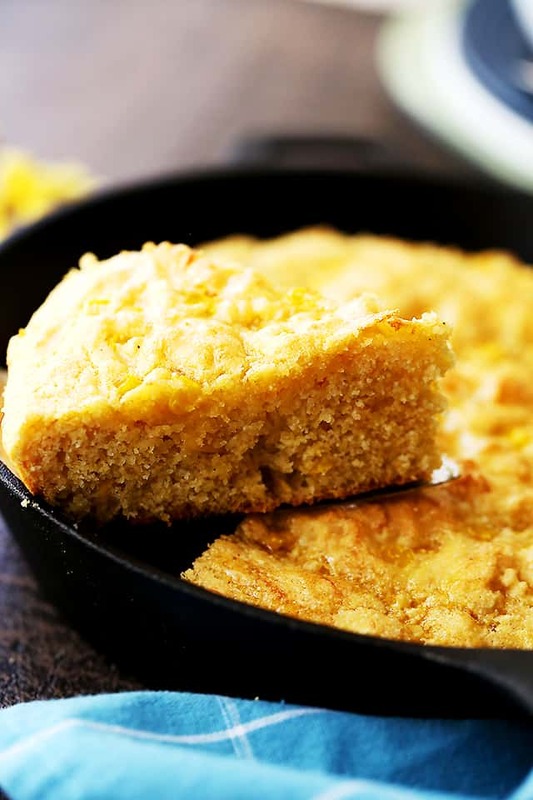 I’ve had simple cornbread and a kitchen sink version … like the one with everything in it best. While I appreciate the lightening up part of this recipe, no Southerner I know adds flour to cornbread. Cooks Illustrated & Americas Test Kitchen are taped in the Northeast, therefore they know nothing about southern cornbread. Sorry. Yum! 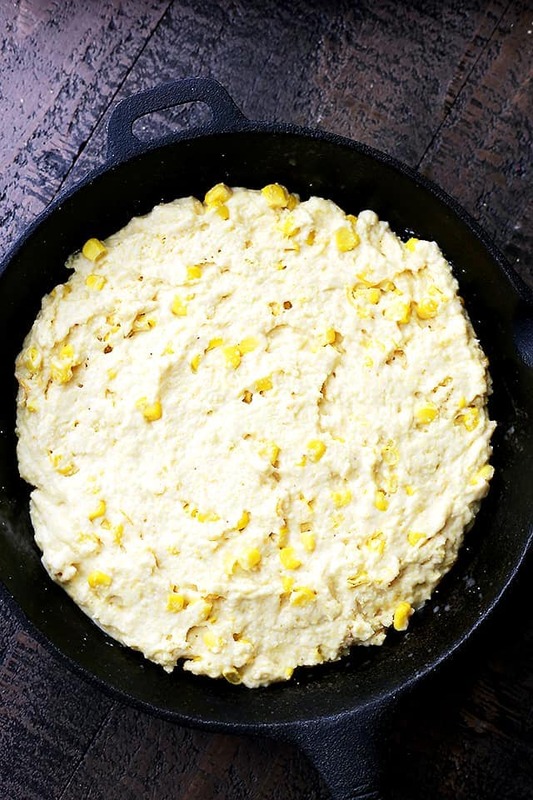 I do not make cornbread often enough, cannot wait to try your version! As a cornbread fan, I thank you for lightening this up. Making it!